Fintie Slim Case for All-New Amazon Fire HD 8 Tablet (7th and 8th Generation Tablets, 2017 and 2018 Releases), Ultra Lightweight Slim Shell Standing Cover with Auto Wake/Sleep, Black. PLEASE NOTE: This case is designed for All-New Amazon Fire HD 8 tablet (8" Display, 8th and 7th generation - 2017 and 2018 Release). Also Compatible with Fire HD 8 Previous 6th Generation (2016 Release). It will not fit for any other Kindle Fire tablets. 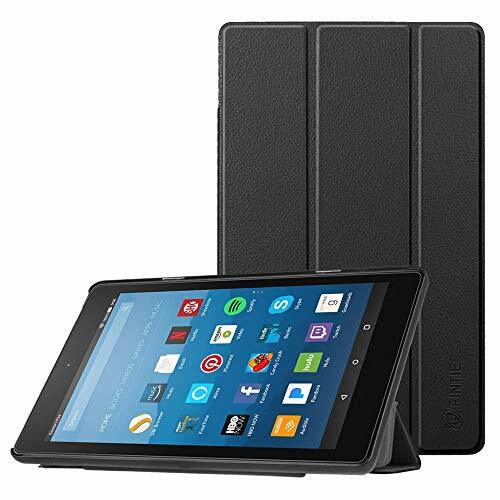 Protect your Amazon Fire HD 8 tablet with this Fintie Slim Shell Case at all times! The Slim Shell Case sports a simple and classy design. The back shell is made from durable polycarbonate material so you do not need to worry about any damages. It offers an easy clip-on application. Because the cover is uniquely designed to flip back and transform the case into a comfortable viewing stand that offers two different viewing angles, this capability allows the viewer to use the Amazon Fire HD 8 hands-free whatever your position may be without strain whether it is being used for viewing or for a keypad. All features of the All New Amazon Fire HD 8 are accessible even with the case on. It even includes a camera hole so you can take pictures and videos without removing it. Watch movies and listen to music clearly with speaker holes! This one piece case will fit your Fire HD 8 like a glove. The Fintie Slim Shell Case comes in a variety of bright, fun colors, the widest selections to suite your taste. It offers an ideal way to protect your tablet wherever go.